My Beauty Alchemy is a DIY beauty product subscription box that sends you everything you need to create your own natural beauty products! Their mission is to provide ingredients that are of high quality, fair trade, organic, cruelty-free, and natural. Each box contains materials needed to create spa-like treatments for your face, body, and hair. Coupon: Use code FREESHIP&TOOLS to receive free shipping! The theme for this month’s box is “Decadence,” described here as “luxurious self-indulgence.” The ingredients for the products this month are said to go along with this theme and include scents such as rose and coconut. 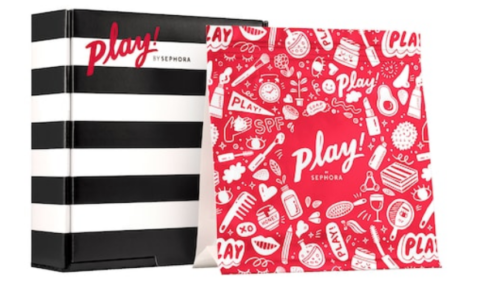 The pamphlet included in the box details the three recipes for the month, as well as some extra information on the ingredients. The box came with a small glass mixing bowl, four wooden mixing spoons, and a mixing brush. I love that you don’t have to search around your house for any tools necessary to make your products! I also like that the glass bowl can be kept and reused – it’s the perfect size for mixing salad dressing or marinades! The ingredients to make the body scrub came packaged loose in the box. The amounts of each product aren’t listed, but the box comes with exactly the amount you need to make the beauty product. This reminds me of a meal kit subscription box, and I really like that there is no need to measure out ingredients and also that there is no waste after you are done. To start making the body scrub, I squeezed out one packet of coconut cream into the small glass bowl. I then added the brown sugar and the rose essential oil. The little vials of essential oil are very cute (actually, all of the packagings in this box is adorable – it really made the experience fun! ), but the vials were difficult to use. The vials weren’t very full (I estimate about 1/8 of the bottle contained liquid) and the dropper did not reach to the bottom of the vial. This meant that I had a hard time using the dropper as intended, and I ended up having to dump the vial straight into my mixture. You can also see from this picture that this was quite a messy project! I didn’t read the instructions thoroughly enough and saw afterward that they told you to use a mug to mix the scrub, not the glass bowl included. Having a higher-walled container would probably have prevented the mixture from getting all over the place. I found it a little difficult to incorporate the coconut cream into the brown sugar, and it took quite a bit of mixing and pressing the ingredients together. The finished product, however, is great! It smells fantastic – the scent is light and not at all overpowering. I also love that I was able to put my finished scrub back into the original brown sugar container. It made the product easy to use in the shower! The scrub was a great exfoliant and didn’t feel too rough on my skin due to the coconut cream contents. The ingredients for the hair mask came packaged in a separate bag labeled “hair.” I think it’s great that they included a plastic cap for your hair, and I appreciate that the item is compostable! I love that the company is dedicated to its mission of organic and natural items down to the smallest details. As with the hair mask ingredients, the ingredients for the face mask came separately packaged in a bag labeled “face.” My absolute favorite part of this box is that a headband to protect your hair was included – what a thoughtful touch! To make the rose clay mask, I first made a mug of chamomile tea. While the tea brewed, I started mixing the white and pink clay powders together. The small containers for the clay are just as cute as the rest of the packaging. After I was done making the face mask I washed out the containers to keep for future use. They are the perfect size to store moisturizers, hair styling products, eye creams, etc when traveling! I then mixed in the aloe vera, a few drops of rose oil, and a small amount of the chamomile tea. The recipe states to mix until the consistency is creamy, but I found that my mixture was quite watery, even though I started out by adding less tea than recommended. Even so, the mixture was very easy to apply. To add to the thoughtful touches in this box, I loved being able to enjoy the rest of the chamomile tea while my mask worked its magic! The recipe says that the mask shouldn’t dry, but I experienced that the mask started to dry almost immediately after applying. I live in a very dry climate, so that may have had something to do with it, or possibly I should have added more tea to my mixture. The mask drying out didn’t bother me, though, as I’m used to most clay masks drying after application. The box included sponges to remove the mask, and the sponges were really neat to use. You get them wet and they expand to be fluffy and absorbent. The sponge wasn’t able to remove the entirety of the mask from my face, but again I appreciated the thought that went into curating this box! The texture, scent, and feeling of the mask really reminded me of the Caudalie Instant Detox Mask. It really did seem pretty identical, although I think the DIY mask may actually have the Caudalie one beat. After using the mask, my skin felt so incredibly soft and luminous! I did the mask the day after my office holiday party and my skin as feeling dehydrated and dull before using it. I was really wowed by the immediate effects! Verdict: I thoroughly enjoyed the My Beauty Alchemy box this month! 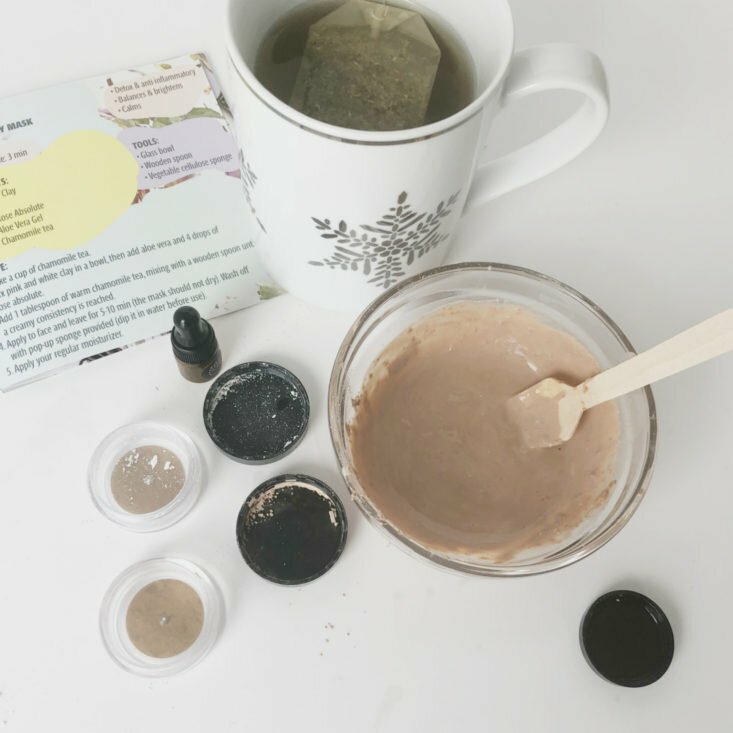 I thought it was such a fun way to DIY beauty products, and I love that the company is committed to using only natural and organic ingredients. It’s very neat to see exactly what is going into the products you are using on your body. I also think that the packaging and thoughtfulness of included products were amazing. It really did feel spa-like and indulgent to make. I think this would be a great box for you if you are someone who likes natural beauty products and also has a little bit of a crafty side! I can also see this box as being a really fun activity to do with a friend, especially since the box contains enough materials to make each recipe twice. Can I still get this box if I sign up today? No, the November box is now sold out. If you sign up today you will receive December’s box as your first box! Value Breakdown: For $36.00, you receive enough ingredients to make six products. That comes out to about $6.00 per beauty item, not taking into consideration the tools that you can keep for reuse. Check out more beauty box reviews in the Beauty Subscription Box List! Did you get this month’s My Beauty Alchemy? What did you think? How do subscribers rate My Beauty Alchemy? Do you subscribe to My Beauty Alchemy? Add your rating now! Oh my, I love this box! I ordered a three -month subscription on the day that I read this review. Of course, I immediately had buyers remorse wondering I what I was getting myself into, but I should not have had any remorse at all! They shipped the same day I ordered it and everything inside is exquisite. Even the exterior of the box and the packaging was professionally and nicely done . The inside Items, while no spoilers from me, are perfect for this month. They are well -packaged, well- presented, beautiful really,smell divine, terrific explanations and just professionally and attractively done. Plus, I am learning about how to make some at home spa-like recipes myself which I have been interested in for sometime.I’m thrilled. Merry Christmas to me. I used two out of the three recipes for a holiday party tonight and I’m pleased. @Krista: Nice review! If you enjoyed making your own skincare, and you like Caudalie products, I’d definitely recommend you read the book “The French Beauty Solution” by Mathilde Thomas (Caudalie’s founder). It’s a tremendous resource — one of THE very best books on skincare. It includes 17 easy recipes for special treatments, (masks, scrubs, etc., for face, nail, hair). All are made from scratch using typical kitchen ingredients. A few require other commonly available items, i.e., essential oils or rose water. Amazon sells the book for ~ $15, but used copies go for ~ $6 (incl. shipping). Beth-I know this was for Krista but I am thrilled to hear about the book. Thanks so much for posting the information!